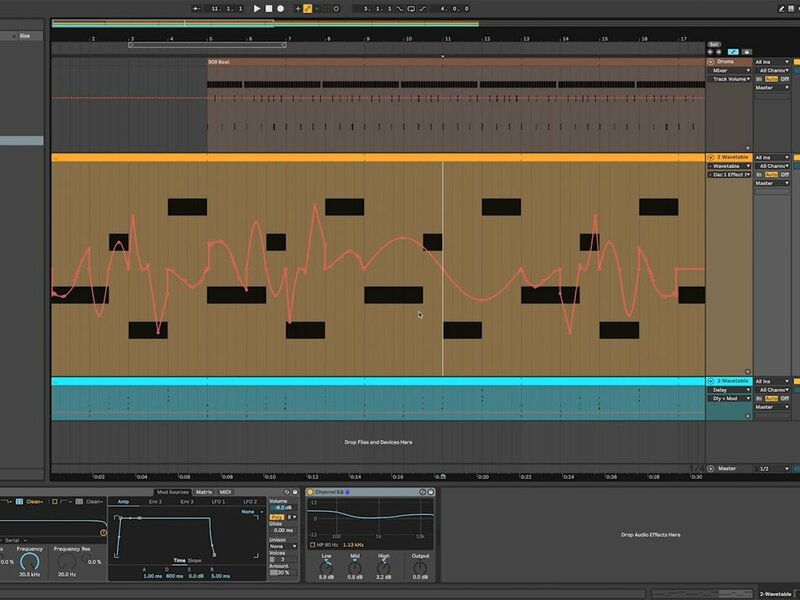 Hear the creative applications of custom wavetables and new devices, and see 10.1’s vastly improved automation tools in action. Ableton today announced the upcoming release of Live 10.1, which features custom wavetables, new Delay and Channel EQ devices, improved automation tools and a plethora of workflow improvements. Since version 10’s release with the major Wavetable synth, Live users have been clamouring to load their own wavetables. Now, you can. In fact, you can load any AIFF or WAV sample and Wavetables will automatically turn it into a useable wavetable. A new Delay plug-in replaces both Ping Pong Delay and Simple Delay, combining their features and adding modulation for tape-like wobble. Channel EQ, meanwhile, is a three-band mixing desk-style equaliser with fixed high and low shelf, fixed low-cut and sweepable mid band. Watch Tom’s track build video above to hear the uses of the new automation tools. These include advanced editing warping of existing automation, as well as the ability to simplify automation with many breakpoint and pre-defined automation shapes – ideal for creating detailed modulation for synths. Making stems with sidechained synths is now a breeze. No more annoying pop-ups when you try to freeze a track that has a compressor being sidechained from another track! Live can now render this offline just like any other track. You can also now include return and master effects when exporting, another huge timesaver if you’re bouncing stems for a live show, mixing or mastering. Between a series of new navigation shortcuts and pinch to zoom on certain components, navigating your Live arrangement is easier than ever. Somewhere in a distant corner of the internet, a lone warrior screams in ecstasy. Live 10.1 now supports VST3 plug-ins and instruments. We never found a plug-in we couldn’t live without that only supports VST3, but maybe that’s just us… Either way, it’s here in 10.1. As of 6 February 2019, Ableton Live 10.1 is in public beta, with the full release coming soon. It will be a free update to existing version 10 owners. More info at ableton.com.